From our perspective one of the more intriguing embedded environments to appear recently is Atmel's AVR Studio 5. When I first saw a screenshot of this IDE (it was mentioned in a post in the CodeProject Lounge) it was immediately obvious that this was some sort of Visual Studio derivative. 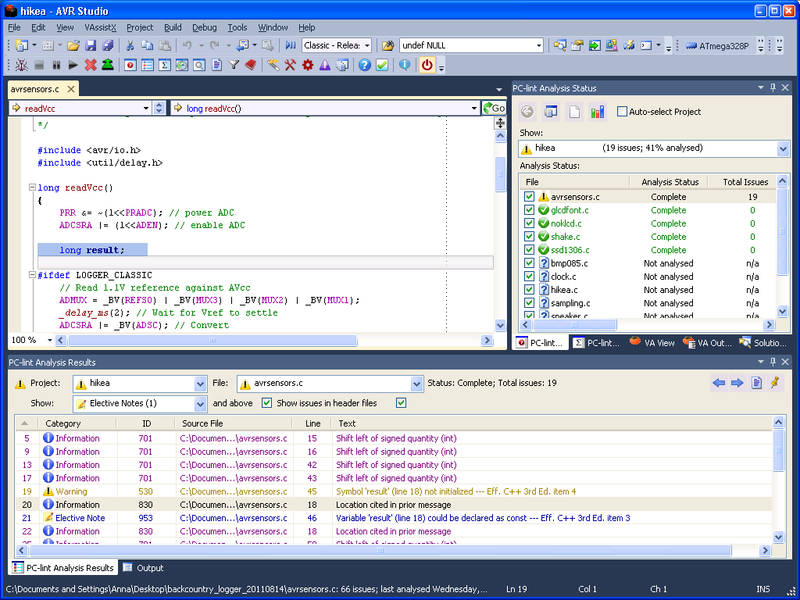 In fact, although it uses GCC toolchains, the environment is based on the Visual Studio 2010 isolated shell (which incidentally is something we briefly considered using ourselves for a future standalone GUI version of Visual Lint, but decided against because of its complexity and the size of the download). It obviously occured to us then that as a Visual Studio derivative, it shouldn't be too difficult to get Visual Lint running within it. The first step was obviously to install the IDE in a VM (XP SP3 - doesn't XP look a bit old these days...?) and experiment with some projects. 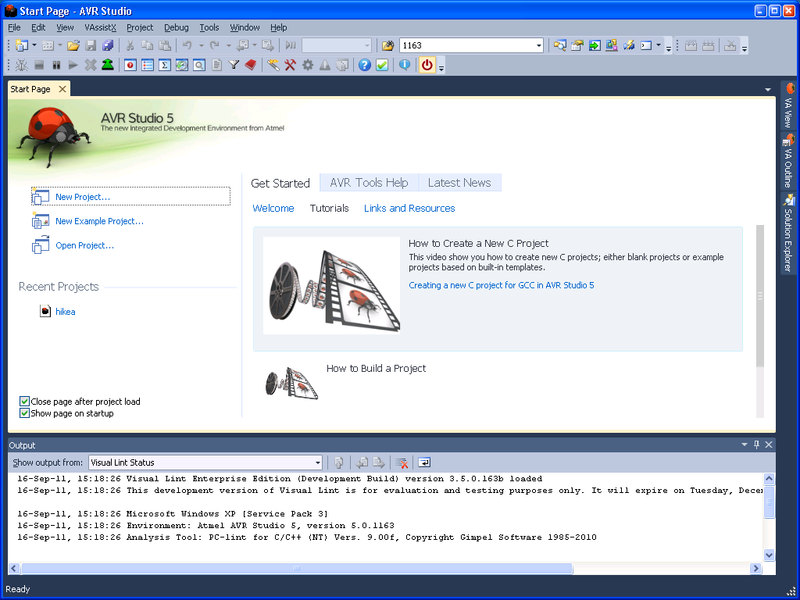 AVR Studio 5 codebases uses the Visual Studio 2010 solution file format (albeit rebadged as a .avrsln file) and a new MSBuild based project file format (.avrgccproj), so the first thing we obviously had to do was implement parsers for these files (something that will also benefit LintProject Pro, of course). Once that was done, we turned our attention to getting Visual Lint to load within the IDE itself. This turned out to be fairly straightforward. Although AVR Studio 5 does not seem to support COM add-in registration in HKEY_LOCAL_MACHINE (which is how the Visual Lint add-in registers in Visual Studio), the corresponding registration in HKEY_CURRENT_USER\Software\Atmel\AVRStudio\5.0\AddIns does work. Although this is problematical from an installation point of view (see my previous post on the Visual Studio 11 Developer Preview) it is not a showstopper by any means. With manual add-in registration in place, Visual Lint loaded within the IDE. Although a few minor tweaks were needed to work around issues such as AVR reporting itself as "Visual Studio Express Edition, version 1.0" (which caused the version detection code in Visual Lint to default to 16 colour command bitmaps!) those were easily addressed. Although we still have quite a bit to do (not least the code editor markers and installer) before AVR Studio 5 can become a supported host environment for Visual Lint this is a very promising start. Needless to say, beta testers are welcome.